All my life I've always helped others and strived to contribute to my community. I first learned about PPALM when I was a student at the U.S. Army’s Command and General Staff College at Fort Leavenworth, Kansas in 2013. I was intrigued by its positive contribution to the community. A fellow soldier and college ROTC friend was a PPALM member at the time and encouraged me to not only join, but to volunteer as the president of PPALM’s Fort Leavenworth chapter. During my tenure as the chapter president, I networked to gain senior mentors for our organization and gained wisdom from them and their life and professional experiences. During a recent deployment, I experienced both personal and professional challenges. I was grateful to lean on one of my PPALM mentors during that overwhelming time, as he talked me through my priorities and work-life balance. I now find myself drawn to other soldiers in similar situations. I have walked down the beaten path, and I can share my experiences with others and help them grow. As I also grow into my career, I find mentoring to be very rewarding. It's not about what I've achieved myself, but rather the satisfaction I receive when I pay it forward. Rochelle S. Ruiz Pressley is an active duty major in the U.S. Army. She currently serves as a battalion executive officer in Fort Bliss, Texas. I believe that mentorship is very important, especially for those new to the military or any industry. There is a lot that we don’t know when starting a new career so having a mentor allows us to fill the knowledge gap. I started my first formal mentorship session when I was in college. I met regularly with my academic advisor and ROTC instructor. I remember talking about how I felt overwhelmed with balancing my priorities, and both of my mentors were willing to provide assistance when I had a lot on my plate. By building rapport and trust through our continued meetings, they were able to offer me more personal feedback, which helped reduce my stress. They always encouraged me to pursue my goals and dreams, and they were an integral part of my support system. They helped me achieve my goal of graduating and commissioning in the military on time. Currently on active duty, I meet regularly with mentors both inside and outside my chain of command. Since my current project involves many moving parts, meeting with my supervisor and seeking understanding of my job duties is critical. Knowing that I can always go to my supervisor for help or to provide understanding of a topic I’m not familiar with makes the job more manageable. Apart from discussing work duties, my supervisor also gives me great advice on leadership, career planning, and writing performance reports. Additionally, meeting with my mentor outside my chain of command allows me to gain broader insight. Since my mentor outside my chain has a different career background from my supervisor, I’m able to get a second opinion on career planning and general officership topics. I find that meeting with different mentors allows me to gain understanding of different perspectives on handling situations, which ultimately guides my own decision-making process. I find myself sharing helpful things I’ve learned from my mentors with other young officers, whether it’s through shared anecdotes or through other professional organizations. I found out about PPALM through Major General Taguba. I believe that mentorship is most effective when you have mentors who have had similar career paths. By being a part of PPALM, I hope to find mentors who can provide career guidance and networking opportunities that will help me achieve my goal of working as an acquisitions professional in Washington, D.C.
Jeric Mibale is a second lieutenant in the U.S. Air Force. He is an acquisition officer and currently serves at Los Angeles Air Force Base, Calif. These are his own individual sentiments. 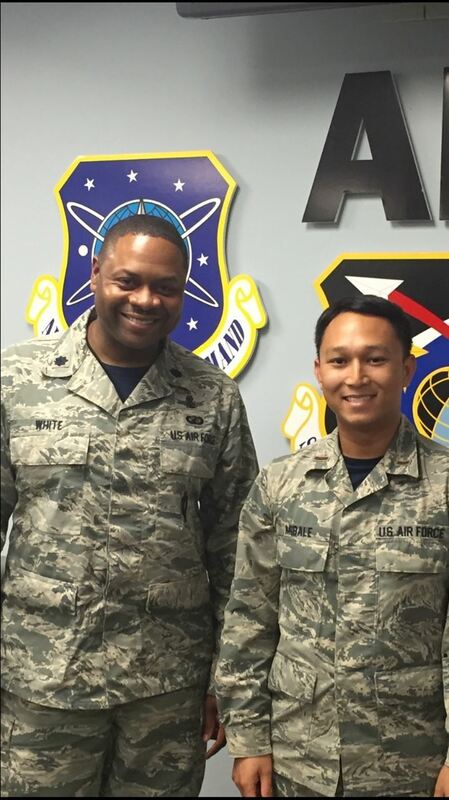 October 2016 -- Second Lt. Mibale and his mentor, Lt. Col. White at Los Angeles Air Force Base, Calif. I first learned about PPALM in t late spring of 2011, after meeting Major General Tony Taguba at an event where he presented a scholarship for leadership and courage at the University of Maryland. At that time, I was an Air Force ROTC cadet, but had recently learned that I was not going to be receiving my commission upon graduation. After dis-enrolling from the program I was unsure about my path ahead, but still felt a strong desire to serve the US. After approaching Major General Taguba for advice on next steps, Major General Taguba suggested I join PPALM and seek mentorship from its members. After joining, I was paired with General Taguba, who provided me with great insight on my journey to gaining my commission to finally serve through the United States Marine Corps. Since graduating from the University of Maryland in 2012, my journey took four years, during which I actively kept in touch with Major General Taguba and volunteered at PPALM events. Attending the general membership meetings allowed me to connect and network with other mentors who offered thoughtful encouragement and insight. Along with providing numerous opportunities to learn about my personal and professional goals, my participation in PPALM has only further reinforced the importance of community in developing leadership skills, professional growth, and increasing diversity in the US military. Without General Taguba’s guidance and mentorship, I would have not been able to fulfill my desire to serve. Since successfully completing USMC Officer Candidates School in early 2016, I am thrilled to begin a new journey, this time as a Second Lieutenant in the United States Marine Corps. 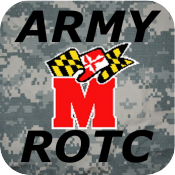 Jonathan Ung serves on active duty in the U.S. Marine Corps. He is currently a student at The Basic School. After graduation, he will be a student naval aviator at Naval Air Station Pensacola in Florida. 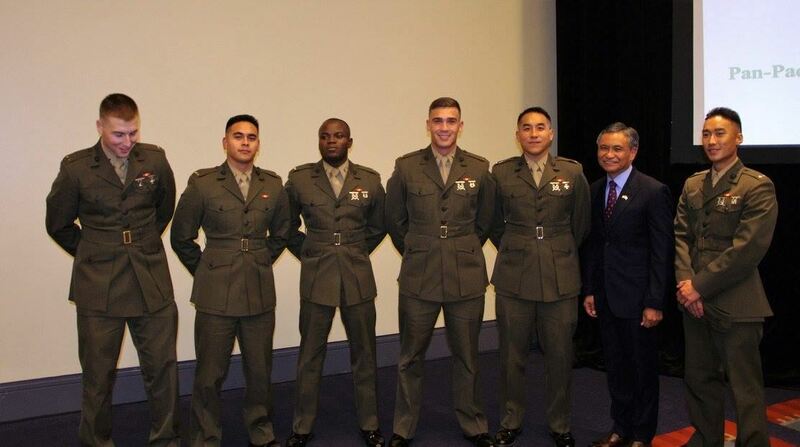 October 3, 2016 -- U.S. Marine Corps officers pose with PPALM Chairman MG Tony Taguba, U.S. Army, Ret. Third from the right, 2nd Lt. Jonathan Ung, was one year ago a civilian and longtime PPALM member. He dreamed of one day becoming a military officer. After closely working with his PPALM mentor, MG Taguba, for several years, he achieved his dream of earning his commission this year. He currently serves on active duty and is a student at The Basic School at Marine Corps Base Quantico.